Northern Ireland are due to go to the polls on 2nd March 2017 to elect a new Assembly after the executive collapsed over a botched green energy scheme in January. Five weeks of campaigning began when the old Assembly was formally dissolved on 26th January. When the election was announced, the BDA (NI) recognised the need for the Deaf community to have better access to information about the candidates and the issues. The BDA contacted a long standing supporter and politics lover, John Carberry, who agreed to work in partnership to set up an event. He had been involved in a previous BDA event at the time of the European Referendum. 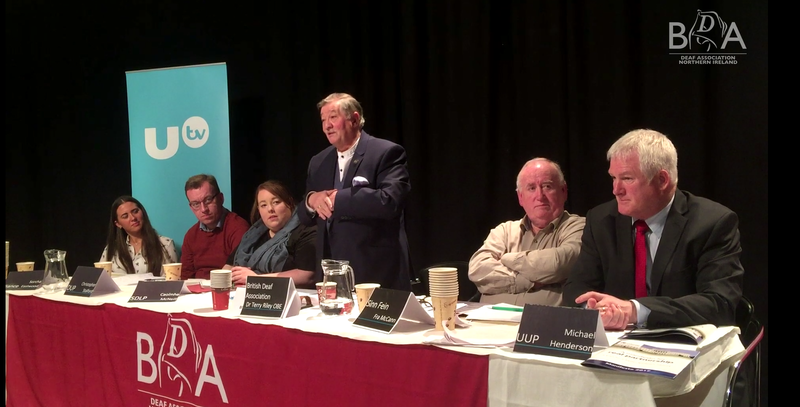 The result of the partnership was an evening attended by sixty-two Deaf people at the Ulster Television Studios in Belfast last night (Feb 21). UTV were very accommodating and were happy to offer John and the BDA the use of their studio as a venue. Opening the meeting was Paul Clark, a newsreader for UTV, who welcomed everyone and reminded the group why it was important to vote and that by doing so they could influence things in the future. Terry Riley (BDA Chair) was also present and he facilitated the meeting by introducing each of the five main political parties. They were, in alphabetical order: Sorcha Eastwood (Alliance), Christopher Stalford (DUP), Caoimhe McNeill (SDLP), Fra McCann (Sinn Fein) & Michael Henderson (UUP). For those in England, Scotland and Wales this may sound strange but it must be remembered that NI has a different political structure to Great Britain where there are no Conservative or Labour and so forth. Each political party gave a short three minute presentation outlining their parties manifesto and then the floor was opened up to questions. A lively question and answer session took place on a wide variety of subjects such as education, employment and the recent Sign Language Framework. It was also interesting for the representatives to hear the views of the Deaf community and it was clearly a learning experience for some of them to be made aware of employment issues, barriers and lack of access and that it was not about the medical model of deafness but about language choices. It was very positive, though, as they all agreed to address the difficulties experienced by the Deaf community. Of course, all of this was fully interpreted to give full and equal access to everyone there and BDA (NI) hopes that the Deaf community can now make a more informed decision when it comes to voting day and take part in this important civic activity. In addition to the benefit to the Deaf community and our political system, the event also raised the profile of the Deaf community and the work of the BDA (NI) as articles appeared on the BBC News (NI Politics) website, Radio Ulster and video clips appeared on BBC Newsline.